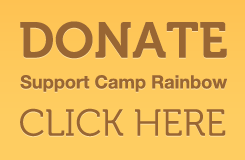 The kids of Camp Rainbow have arrived!! They are here and ready to go! If you were here and looked around, you might see some of them with a fishing pole in their hand, some with goggles, and some with paint on their faces. You may have a tough time keeping up with them because they are so excited to be here! They are jumping around like crazy. Literally jumping because U-Jumpin’ Foulks have graciously came down with some of their awesome inflatables. Not just one or two, but SIX inflatables! AND a cotton candy machine AND a ride along train. They are having just as much fun as the kids are. The Activities Buildingis jammed full of kids who are making crafts. We even have some very dedicated kids who are already working on their Derby cars for the big race on Friday. Can’t wait to see what they all come up with as the week goes on. We are catching a TON of fish down at the lake. The kids have been reeling in some big ones. Wonder who will catch the biggest fish this week. Guess we will see. There are so many fun things that are going on right now and I need to go see what’s going on. We will be talking to you soon.